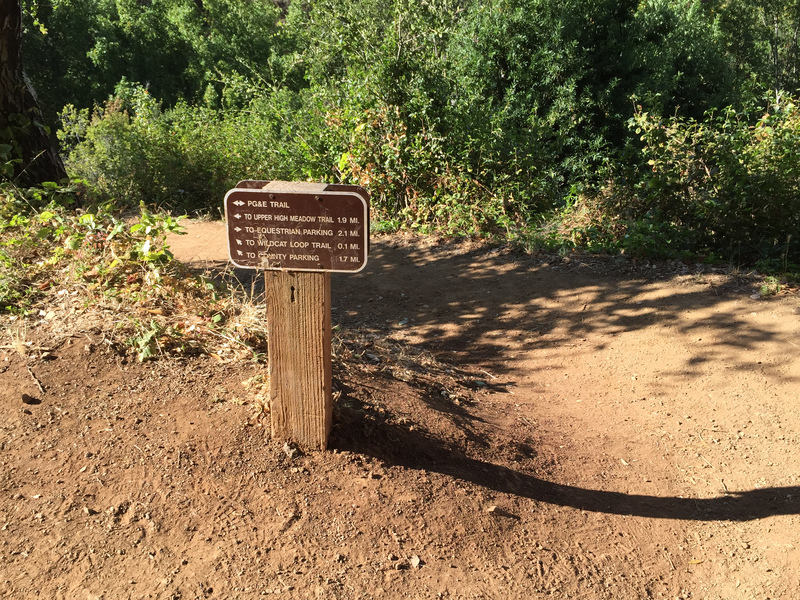 PG&E Trail is part of the Rancho San Antonio Open Space Preserve (OSP). 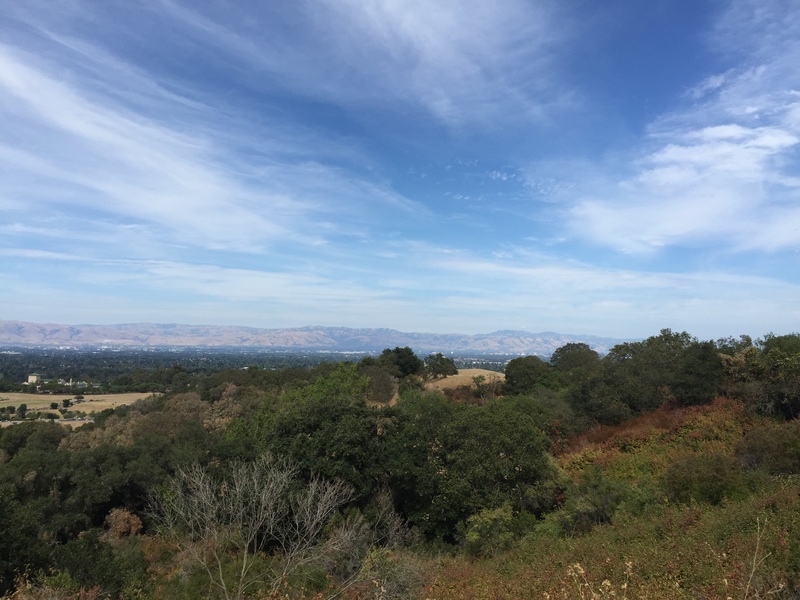 We had initially planned on walking the PG&E Trail till the Vista Point at 37°19.83′ N 122°7.90′ W (per the paper map we had picked at the trailhead) and then come back on the same trail. The Vista Point is also where the PG&E Trail ends (branches out into other trails). The distance to this point is 3.9 miles (6.27 km), which would have meant us walking a total of 7.8 miles (12.55 km), out and back. We were not ready to walk that long on our first hike, what with the elevation and heat. So we decided to take a detour to the Wildcat Loop Trail eastwards, while we still could, and continue the loop on Coyote Trail and back on the PG&E Trail to reach the parking lot. In all, we managed a 4.7 miles (7.5 km) in 1.5 hours. It was a great, first experience of hiking together! A lot of people were still coming to the trail after 5:30 pm, in large groups and with families/kids. PG&E Trail: By far, this trail is the toughest and steepest out of the three we hiked, though it is wider than the other two. It is shaded well by trees in parts. This trail provides stunning vistas of the valley below and beyond. You can see the bay water. Wildcat Loop Trail: This is a single-lane trail and completely shaded. It has almost no incline. It seems to be a very popular trail; there was more traffic here than on the other two trails. There are no vistas of the valley from this trail because this trail is near the valley floor. Coyote Trail: This one again is a single-lane trail and completely shaded. It has a bit of incline before it joins the PG&E trail. PG&E is not a loop trail. Going west, it becomes the Upper High Meadow Trail to the north, which turns back eastwards, heading toward the parking lot. To the south, the PG&E trail bifurcates into the Quarry Trail, which ultimately joins the Black Mountain Trail. Wildcat Loop Trail also, technically, is not really a loop. You can make it a loop by combining it with the High Meadow Trail. If a trail has minimal exposure to sun, it means there is a thick tree cover over the trail. That’s a boon when you are hiking in the day time. On the flip side, the tree cover can make the place go dark sooner than the sunset time. So if you are hiking in the evening and planning to finish up by sunset, you need to be careful and prepared to walk these trails in a not-so-lighted surrounding. Carry a torch and a whistle for these times. Parking Lot: Approximate location: S Meadow Trail, Cupertino, CA 95014. Exact coordinates: 37.329818, -122.085528. Ample space; multiple parking lots in a one-mile radius. Restrooms: None. However, there is one (as per the paper map) further up in the next parking lot, 0.5 mile away, via the Rancho San Antonio Service Rd. Map: Paper maps are available at the trailhead next to the parking lot. Exposure to sun: The PG&E trail is shaded only in parts. There might be stretches without any shade. The Wildcat Loop and Coyote trails are sufficiently shaded. Crowd: The trails as well as the parking lot can get pretty crowded over the weekend. This OSP is a very popular spot.